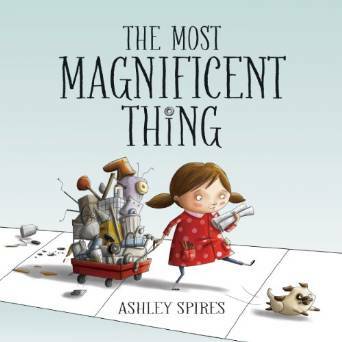 The Most Magnificent Thing by Ashley Spires is an adorable book about perfectionism. In it, a little girl’s imagination motivates her to create something wonderful. Although the creation seems easy to do in her mind, she finds that actually creating it is a lot of hard work. Frustrated that her hands are not doing what her mind sees, she gives up. Her assistant motivates her step outside of the problem for awhile. Space and time are just what she needs to finish the design in her mind. I absolutely LOVED this book. It was a great story for my preschool daughter while still providing a good life lesson not only for her but for me. The Most Magnificent Thing is a must read! It is a lovely book to motivate children to push beyond frustration when things aren’t going their way.